Are Stock Garage Plans Sealed or Stamped by an Engineer or Architect? When building a new garage, it is possible that your city, county, province or local municipality might require that your garage plans are sealed or stamped by an engineer or an architect. Our garage blueprints do not come with an engineer’s or architect’s seal or stamp on them. They are considered pre-drawn, stock plans. This means they are designed to meet the national building codes in place at the time each plan was created. We cannot guarantee that our garage blueprints will meet all local building codes and requirements for your specific area. Because our plans are sold and built all over the US and Canada, it is impossible for our designers to ensure the blueprints will meet all local codes for every location, city, county, municipality, etc. Therefore, our plans do not include an engineer’s or architects seal or stamp, as the seal or stamp is a local requirement. The items required for the engineer’s or architects seal or stamp in one part of the country are completely different than the requirements for a customer building the same plan in another part of the country. Often the requirements that coincide with a seal or stamp for a particular state, province, city, etc., are influenced by climactic and geographic elements that are specific to the area where the plan is built making them local requirements. For example, someone building a garage in certain parts of California will need engineering to meet seismic codes, while a customer building the same plan in the Rocky mountains may need engineering for wind and snow load. It will be up to you or your builder to hire a local engineer or architect to review and seal or stamp the garage plans before obtaining building permits. This design professional must be licensed in the state or province where the garage will be built. We recommend finding someone who can review the blueprints and provide an engineer’s or architect’s seal or before you actually purchase plans. Sometimes the design professional providing the seal or stamp will have a preference as to which plan package he/she works with, and this will influence which blueprint package you purchase. Most likely he/she will want the CAD file or PDF because it is much easier to work with the electronic format when it comes to adding extra notes and elements to the plan that are necessary to meet local building codes. The only way to be sure about what plan package to purchase is to ask your local design professional before you make a blueprint purchase. There is information about this topic in our FAQs should you need to reference it later. Additionally, you can find other helpful information about our blueprints in our Resource section. Coversheet: This page is an artist’s rendering of the finished garage. It is used as a visual aid and represents the completed structure after it is built. In most cases, the coversheet is not necessary for the construction of your new garage. Therefore, some designers do not included it in their construction drawings. 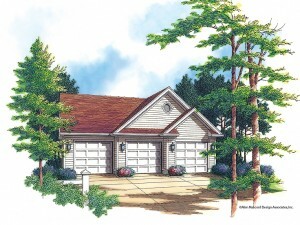 Exterior Elevations: The exterior elevations page(s) depict the exterior of the garage on all four sides. They indicate the exterior finish and trim of the garage by calling out the materials used to finish the outside of the structure such as brick, siding, stone or stucco. The elevations note the placement of these materials on the exterior of the garage. Additionally, roofing materials are specified and roof pitches are indicated. Finally, the exterior elevations note or depict decorative elements like porch columns, carriage lamps, and window shutters. Door and window sizes may be shown on the exterior elevations as well. Foundation Plan: The foundation plan is a detailed drawing of the garage foundation. It reflects pertinent information about the foundation such as dimensions, column locations, and concrete thickness of footers and foundation walls, as well as other necessary details. Floor Plans: The floor plan page(s) indicate the layout and construction of each floor of the garage. They typically provide room dimensions, wall sizes, door and window locations, notes about ceiling details and design, and other pertinent construction notes and details. Interior Elevations: When applicable, the interior elevations describe and provide details and drawings about the built-in elements of a garage apartment or other finished space such as cabinets, handrails, moldings, vanities and built-in shelves or niches. Simple Plumbing: The simple plumbing information is usually found on the floor plan page, but sometimes it is on a separate page. It depicts placement and locations of bathtubs, showers, toilets and sinks when applicable. Basic Electric: The basic electrical information can be found on the floor plan or on a separate page. It reflects the suggested locations of outlets, fixtures and switches when applicable. Sections: Garage plan sections may be found on a separate blueprint page or they might be found on various pages throughout the construction drawings. Typically, they are views of the garage which show the elements and composition of the foundation, interior and exterior walls, floors, stair details and roofs. The sections show the relationship between floors and indicate rooflines and ceiling heights. Details: Construction details can be found throughout the set of blueprints or they may be found on a separate page. These details convey information about how smaller elements of the structure should be constructed. Some examples include the design of handrail spindles, sizes and styles of trim and moldings, or the look of the fireplace. Please Note: Blueprint pages vary by designer. Not all stock garage plans incorporate every element described above. For additional information, please read, What you Need to Know about Stock Garage Plans. Understanding the elements of stock garage plan and the information that composes a set of blueprints will help you determine if a stock garage plan is right for you. 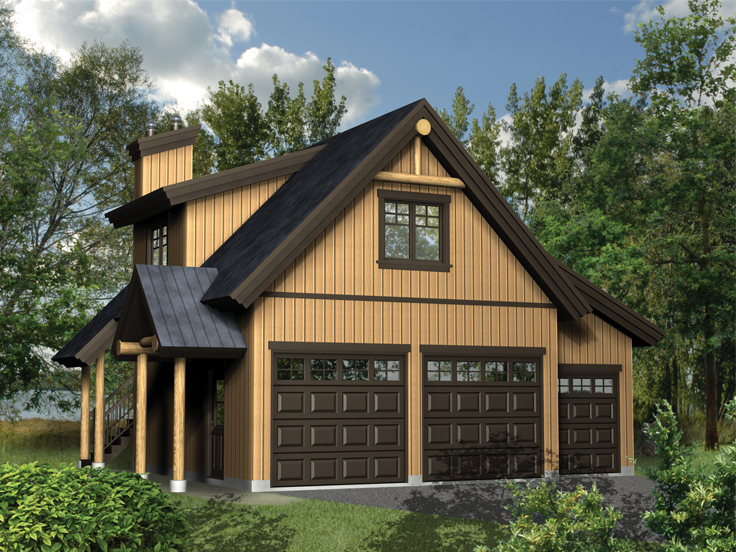 Here’s a 3-car garage plan that has more to offer than meets the eye. The stylish exterior is graced with tiered gables and a siding façade. Behind each of three overhead garage doors, extra deep parking bays accommodate boat storage and the oversized vehicle used to pull the boat to the lake or river. Fisherman and boating enthusiasts will love knowing everything is in one place. Use the extra parking bay for storage of lifejackets, fishing poles or other watercrafts like a pair of canoes or kayaks. 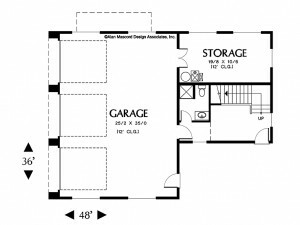 Delivering 1068 square feet of usable space, this boat storage garage plan is practical and accommodating. 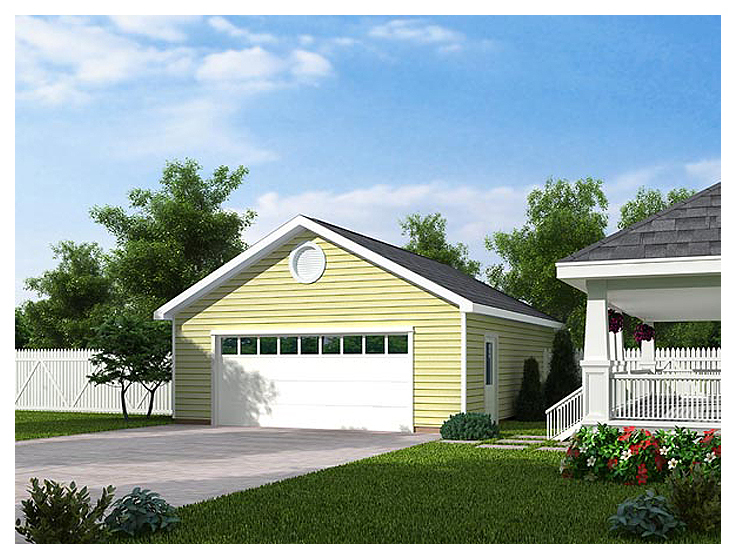 Find out more about this garage plan.